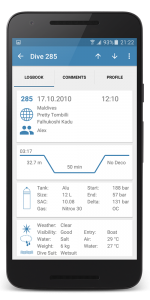 I have been looking at the windows phone version of Diving Log, it looks great - the Android software is nice, but not as well integrated (not surprisingly). I know nothing about coding so don't know if this is possible - but what are the chances of porting the windows phone version to Android? I know I would pay for it. Porting is always difficult and means mostly a complete re-write. And that's exactly the problem. As much as I would like to provide apps for all platforms, it's not possible for me. I have to cooperate with other developers and I can only do one platform myself. Starting with Windows 8 I have to manage now 3 different apps (desktop, tablet and smartphone). The Microsoft ecosystem has the fewest hurdles and I can share a lot of code between all platforms. Also the development system from Microsoft for Windows Phone, tablet and desktop is the best from all available systems. Android from a developer point of view is really not the nicest platform. Bad development tools, fragmentation, almost no device updates, which results in a lot of old devices and makes it impossible to use the latest API's. Developing for Windows Phone is a joy and saves me a lot of time, which I can spend on the desktop and tablet apps. Windows Phone is an underated platform and a lot better than it looks like first. For a developer, it's the best platform available. My hopes are, that maybe some Android users will switch to WP when their contracts expire. It's not as open and flexible as Android, but that has not to be a bad thing.